Meant to Be is my Valentine! Make it yours and WIN! Hello there dear readers! Time to dust off ye olde blog (I’ve been hanging on Twitter and Tumblr lately) for some celebratory awesomeness. Valentines Day is coming up, and while it’s a much-maligned holiday these days and hipsters love to hate on it, I think there’s a lot to love about Valentines Day. First of all, CANDY (though let’s not talk about how they changed the candy heart flavors, because the new ones are BLASPHEMOUS! The yellow ones used to taste like banana and now they taste like lemon Pledge. Gross). Also, awesome V-Day cards, which I still try to find a reason to purchase and distribute (even if it means giving Valentines to my dog). But I want to make Valentines Day 2013, the first Valentines Day that Meant to Be is out in the world, UBER-FUN. So guess what? LIVESHOW! TWITTER CHATS! ROM COMS! GIVEAWAYS! On Wednesday, February 13, I’ll be celebrating Valentines Day Eve with fellow YA Author Alexandra Monir in a live show over at Shindig! We’ll be talking about writing YA romance, favorite literary couples, and answering YOUR questions. Just follow the link to join in. If you’ve been following me on Twitter, you know I’ve started a fun little adventure of livetweeting my fave rom coms. I call it #ChicksLuvFlicks, and on Valentines Day, I’m celebrating with a special livetweet of one of my all-time favorite high school rom coms, CLUELESS! All you have to do is queue up the movie (available on Netflix Instant, iTunes, and Amazon Prime) at 7pm and follow along with the hashtag #ChicksLuvFlicks. Be sure to join in, because I’ll be giving away some fun prizes during out chat! And now for the big contest…. Make MEANT TO BE Your Valentine and WIN! To celebrate Valentines Day and three months of Meant to be out in the world, I’m giving away some awesome prizes! I’ve got a signed copy of Meant to Be, a Valentines Day swag pack with signed Meant to Be bookmarks and postcards (and some fun surprises! ), and a $50 Amazon gift certificate. Yep, that’s THREE PRIZES up for grabs. But that’s not all … one lucky winner will get a character named after them in my brand new novel, that I’m working on now and can’t wait to tell you all about (but that comes later!). That’s right, I’ll name a character after you! So how do you get in on this Valentines Day Extravaganza? Easy peasy! All you have to do is Tweet or Tumblr a picture of yourself holding a copy of Meant to Be. The only rules? The photo can’t be in a library OR in a bookstore (but you can use a local library copy!). You can also use your e-reader copy. 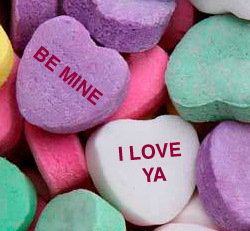 Include the words “Meant to Be is my Valentine!” and either link to this post or include the shortlink in your tweet (http://bit.ly/XGtKyT). Then come back here and leave a comment with a link to either your tweet or your Tumblr post. And yes, you get one entry for a tweet, and one entry for a Tumblr post, giving you TWO chances to win. UPDATE: After some requests, YES you can photoshop your picture with the book cover. You are entering to win a copy, after all! Just follow all the above rules, and you’re entered. The contest starts NOW and ends at 11:59 Eastern Time on Thursday, February 14. On Friday, February 15th, while I’m experience a chocolate-induced Valentines Day hangover, I’ll comb through all the entries and randomly pick four winners. And because I know you’re all going to ask, YES! This contest is INTERNATIONAL! So time to dust off your copy of Meant to Be, whether it’s on your shelf or living on your e-reader. And if you don’t have one, what are you waiting for? Stop by your local bookshop, visit your favorite online vendor, or pop on over to your local library (and if your library doesn’t have it, simply ask them to order it!). You’ve got 10 days to get your entries in. Don’t miss out! Snap, tweet, tumble, comment, win! There’s the link to my tweet. I’m sad to say I don’t have the book but I want it! That’s why I’m entering the contest…to win the book…because I don’t already have it. Logic? I have a quick question: is the twitter chat according to Eastern time zone? Thanks for the amazing giveaway! Loved Meant to Be! Here’s the link to my tweet.